Image Comics is pleased to announce a special, limited variant cover for SEVEN TO ETERNITY #5 by Rick Remender (DEADLY CLASS, TOKYO GHOST, BLACK SCIENCE) and artist Jerome Opeña that will kick off the second story arc of the bestselling series. This cover will feature a flashy silver foil treatment of the SEVEN TO ETERNITY title logo. SEVEN TO ETERNITY #5 returns to the adventure with Adam Osidis and the Mosak’s arrival at the crossroads. The choices they make here will echo throughout the lands of Zhal for all eternity. This first issue in the new story arc will also feature variant covers by Phil Noto and Rafael Albuquerque. The God of Whispers has spread an omnipresent paranoia to every corner of the kingdom of Zhal; his spies hide in every hall spreading mistrust and fear. 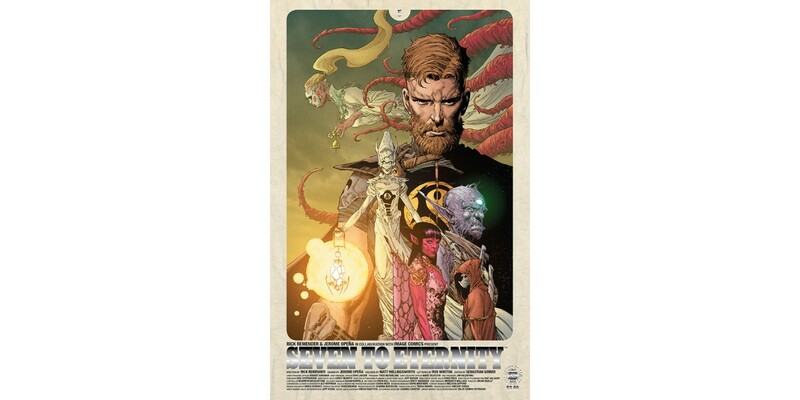 SEVEN TO ETERNITY follows Adam Osidis—a dying knight from a disgraced house—who must choose between joining a hopeless band of magic users in their desperate bid to free their world of the evil God, or accepting his promise to give Adam everything his heart desires. SEVEN TO ETERNITY #5 Cover A by Opeña and Hollingsworth (Diamond Code FEB170623), Cover B by Noto (Diamond Code FEB170624), Cover C by Albuquerque (Diamond Code FEB170625), and Cover D Silver Foil (Diamond Code JAN178439) hit stores on Wednesday, April 12th. The Final Order Cutoff deadline for comics retailers is Monday, March 13th.